The Raymarine A70D has the largest screen of the triad of new release A-series chartplotter fishfinder combo units. Like the other fishfinder versions of the new release Raymarine A-series units, the A70D ships with a 500-watt internal sounder and an internal GPS receiver. Our test unit also came with preloaded cartography covering U.S. coastal waters, both mainland coasts, and the Great Lakes. The A70D can be ordered without preloaded cartography or with coverage for Latin America, Oceania, Southern Asia, Africa, and the Middle East. Any A70D can also use Navionics Gold or Platinum cards in its single card slot. Our test unit also shipped with a P58 transom-mount transducer, which we temporarily affixed to the transom of our Seacraft test boat to accomplish our sonar review. When equipped with this transducer the sounder puts out its full 500-watts of power. For freshwater use the A70D can be fitted with a P48 transducer, which automatically limits output power to 400-watts. A variety of optional transducers are also available for the A70D. The display unit measures 9.1-inches wide, 6.7-inches high, and just under 4-inches deep. We mounted the Raymarine A70D to a test board using the supplied bracket. The bracket is beefy, swivels, and allows you to run wires for the display unit hidden inside. A single lever locks the unit tilt angle. Unfortunately, swivel and tilt angles are preset and none of them seemed to work really well for us. In our opinion, the bracket is too complex to install and not as sturdy as wed like. Our first choice with this unit would be flush mounting. Hardware to do so is supplied. Power and NMEA0183 data pass through a single cable that attaches to the case back with a twist lock connector, a second cable connection on the back of the unit hooks up to the transducer cable, and the third is a Raymarine SeaTalk next generation connection that is N2K compliant. The A70D has a pair of NMEA0183 ports built-in and either or both can be set to normal or high-speed (HS) mode. A NEMA0183-HS is a necessity today for anyone looking to connect an AIS unit to their chartplotter. The Raymarine A70D display screen uses a landscape layout and measures 5.1-inches wide and 3.8-inches high, on the diagonal it is 6.4-inches. It has a very high 640 by 480 pixel resolution. Even though the A70D display screen is less than an inch larger on the diagonal than the A57D is covers about 30 percent more area and we found that fact to be readily noticeable. The A70D has a big screen look while providing razor details. We rated day viewability on the Raymarine display screen good. When viewed straight on through polarized sunglasses the screen darkens a little. At steep side angles, youll notice it significant darkening. There is a small of amount of screen reflectivity. No screen fogging was apparent in the display at anytime during our testing. The A70D has two screen palettes chart page viewing, day and night. A screen brightness slider appears onscreen after a momentary press of the power button; you then use the arrow keys to adjust the brightness. The Night mode dims the unit significantly and has all the same adjustability as the Day mode. We rated the Raymarine good for night viewability. At night, when viewed from side angles the screen appears to lose some colorization and dim a bit. The Raymarine A70D has five soft keys, six function pushbuttons, and a trackpad with an OK button in the middle. Soft key functions are page dependent with onscreen labels above each key. Hitting the Waypoints function key brings up waypoint related soft key functions. The first one lets you place a waypoint at the cursor position, the second at the vessel position, and the third by inputting latitude/longitude to a Place Waypoint dialog box. The last two soft keys bring you to waypoint lists. A double press of the Waypoint function key is a shortcut to create a waypoint at the vessel position. This works from any screen view. Route building in the A70D is easy once you work you way through a few soft key selected menus and arrive at build a new route. The cursor pad is used to place waypoints on the chart as needed. More soft keys options let you save the route, edit it, follow it, and reverse course on it. We found it to be a very intuitive and easy to use function. A number of page sets can be selected by the user. Each set has five pages that will be soft key selectable. The default page set has a soft key for the chart, sounder, 3D view, chart/sounder split, and chart/3D split. 3D data is only available when an optional map card is installed. Up to 4 windows can be displayed at the same time. A press of the Active key lets you move from control of one window to the next. Onscreen data boxes can be displayed in normal or large on the chart page. Normal has minimal information and wed choose the large mode, which shows cursor position, course/distance to waypoint, vessel position, COG and SOG. Each data point can be changed by the user and the data bar can be set to display on top or vertically onscreen. We tried Heading Up, North Up, and Course Up chart orientation on the Raymarine A70D and all worked very well. It responded quickly when turning in the Heading Up and Course Up mode. Sonar on the Raymarine A70D can be viewed full screen or in a variety of split screen modes. Four sounder page presets allow the user to setup specific views based on their frequency and depth preferences. For example, you could setup a page with full screen high frequency, another with high and low in a split screen view, another with high frequency and bottom lock in split screen with A-scope. Several page set possibilities are avialable. According to Raymarine, the A70D has the most advanced Raymarine fish finder technology on the market today. The sonar will put out up to 500 watts of power. 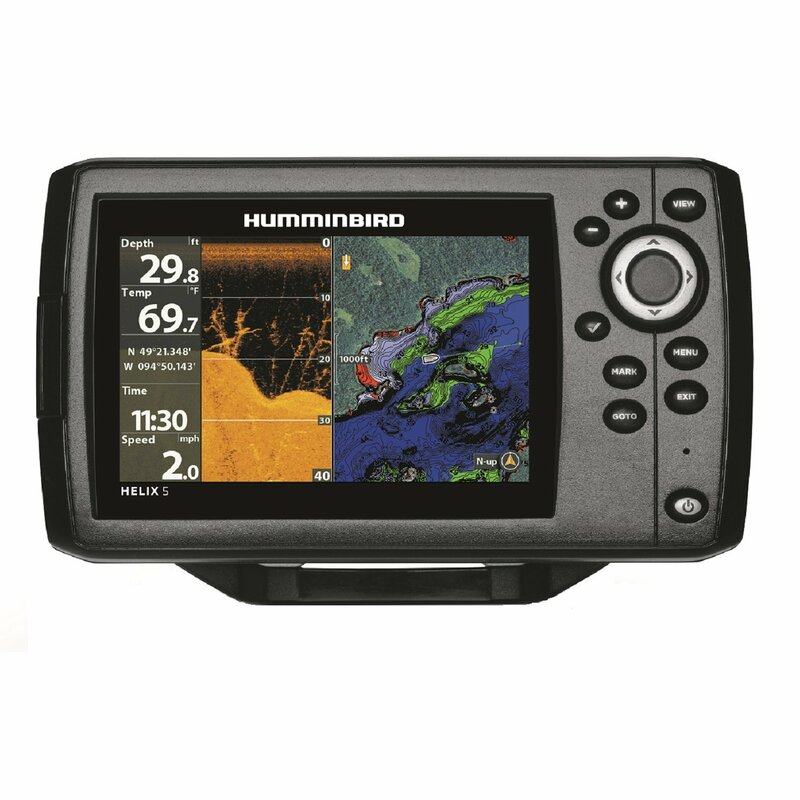 It has a long list of features any boater or angler would want in a fishfinder including dual frequency capability, A-scope, zoom, shift, and bottom lock. In this screen shot of the A70D sonar you can see that both the high and low frequency pulse clearly marked our test target balls. On the right hand side of the screen the 50 kHz output shows a solid fish arch for each target. We shifted the depth by 10 feet and increased the gain just slightly to maximize the view of our targets. During our testing the A70D marked out test targets fairly well with all settings in automatic. Fine tuning the picture with shift and manual gain got us excellent results. The unit did a good job painting bottom contours and a few fish that swam under our test boat. We rated the sounder good for presentation. Sounder settings that require frequent adjustment or fine-tuning like gain, depth, and zoom mode are handled using soft keys. Pressing the menu button while on an active sounder page will bring up the fish finder menu. We found it easy to operate and gave it a good rating for usage. The Raymarine A70D features a 2-year warranty and is waterproof to IPX6 standards, meaning it can withstand a stream of water.